More than 100,000 people walking around today owe their lives to one decision, made by an Indigenous chief on a battlefield in 1885. But that same man has gone down in Canadian history as a convicted traitor, and after a long campaign to exonerate him, the government may be ready to clear his name. The leader’s name was Pîhtokahanapiwiyin, also known as Chief Poundmaker. He is remembered by his people as a peacemaker, who endured a life of hardship. “He was a good man, he took care of his people,’ says Blaine Favel, a former chancellor of the University of Saskatchewan and band member from Poundmaker Cree Nation near Cut Knife, Sask. “He ended up just having a tragic life, he ended up being sick, he ended up dying at a young age,” he tells The Current‘s Anna Maria Tremonti. 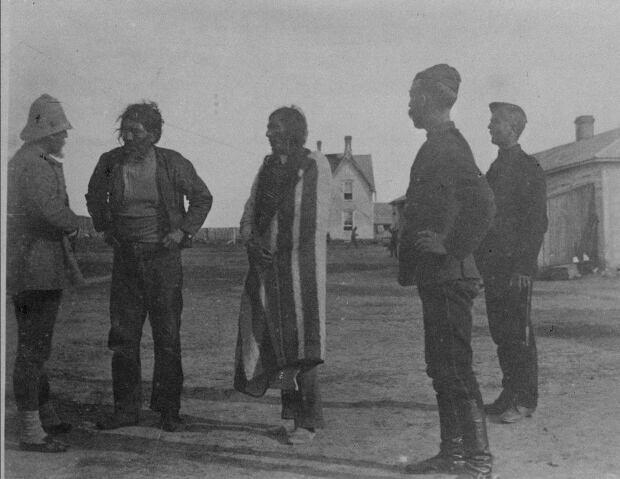 In May 1885, at the beginning of the North-West Rebellion, Chief Poundmaker took a troop of his men to Fort Battleford. Spurred on by the success of Louis Riel, he hoped to negotiate with the Indian agent there and secure treaty payments to help his starving people. Frightened, the people in Battleford fled. Chief Poundmaker waited for two days. The story is that he eventually lost control of his men, who looted some of the empty homes in the settlement. In recent years, there has been debate over whether it was First Nations or settlers who did it. They returned to their reserve, but were pursued by Lieutenant-Colonel William Otter, who acted against government orders and brought 330 Canadian soldiers to launch a revenge attack at dawn on May 2, 1885. After several hours of fighting, the Indigenous fighters had gained the upper hand. As the Canadian government forces retreated, Chief Poundmaker stopped his warriors from chasing them down. That decision to stop the pursuit saved lives, and Favel has done the math on exactly how many: those soldiers who fled could have more than 100,000 descendants alive today. There also “would have been so many more people who died in the plains, if war had been triggered,” he says. When the rebellion ended, Chief Poundmaker turned himself in and was tried and convicted for treason. He was sentenced to three years in the Stony Mountain Penitentiary in Manitoba. He served one year before being released due to ill health. He died a few months later. Favel has been fighting for his exoneration for decades. “I was chief when I was 26, I was a young chief, I’m quite a bit older now, ” he says. Favel is both happy and hopeful at the government’s move to exonerate Chief Poundmaker. This segment was produced by The Current’s Willow Smith and Idella Sturino.